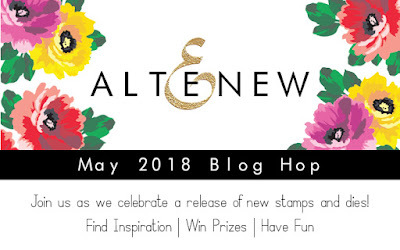 Welcome to the Altenew May 2018 Stamp/Die Release Blog Hop. I am so excited to share a few projects with you using some of the products that are being released today. If you have already been hopping along, you should have arrived here from Svitlana Shayevichs blog! For this blog hop I have played with quite a few of the new release products; Bride To Be Stamp Set, Fabulous Floral Stamp Set and the Fine Frames Circles Die. I have created 2 cards and one layout to share with you today. Keep reading to see my projects and also the two ways you can win gift certificates to spend in the Altenew Store. Before I begin you can see the entire May Release, click HERE. I have also teamed my projects with the 'Our Family' scrapbooking collection from the store. Ok now lets get onto the making, here is the layout I created. I documented a photo from our engagement photo shoot all the way back in 2011. The new Bride To Be Stamp Set made me want to go back through my photo archives to find a photo of hubby and I to document. For the actual design of the page I stuck to a somewhat vertical design with asymmetrical balance. I added clusters of stamped photos to either side of the photo and also the bottom right corner of the page. I used the mini cube ink pads from the store for my stamping. The pastel colour palette of the inks complimented the Our Family kit perfectly. The tag from the kit 'this feels like home' was just the sentiment I needed to reflect my thoughts on this page. My second project I created for this hop is a card. For this card I have used the Fabulous Floral Stamp Set. Now these florals are absolutely gorgeous! The design of this card makes the florals stamped images the focus. The sentiment 'you are fabulous' is a great card sentiment for those everyday uses to show someone that you care. I used a floral patterned paper, stickers and a chipboard word from the scrapbook kit. To frame my sentiment I used the Fine Frames Circles Die - the frame is beautiful and intricate. Another CVS layout - Love you so much! The new Jot Moodboard - designed by me!